Joe and I have spent quite a bit of time in Texas (he close to a year, me 6 months) but even still, we often talk about this place with a bit of wonderment. 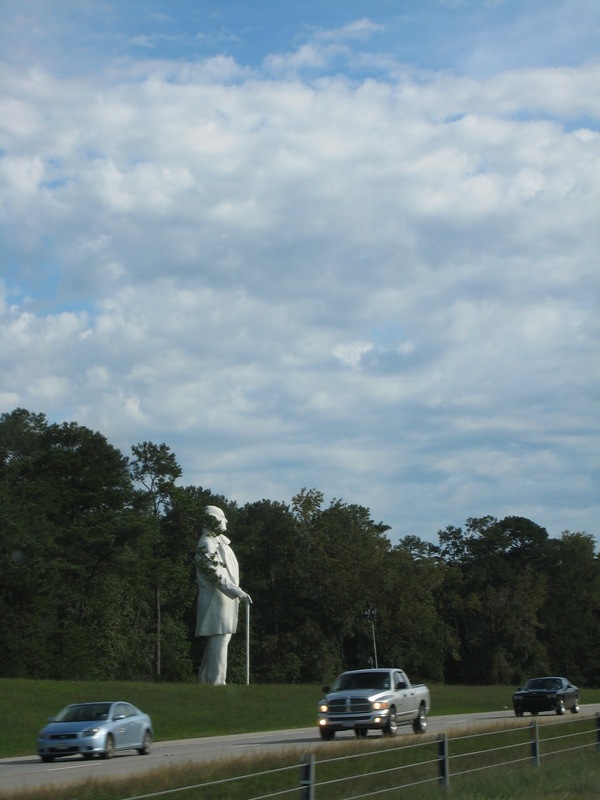 So here are a few of our outsider observations on the lonestar state. Freeways, car lots, shopping malls, vehicles, portion sizes, it's all HUGE here. Occasionally we drive down the street and wonder, "What's that giant resort there? Or is it an arena?" No, it's a church. A church that looks like a campus. Billboards stretch tall enough that even the highest of 5 interlooping overpasses can see them. Your large soda here might as well be a 2 litre bottle. You can Drive-Through for just about anything. Of course, there are the regular fast food drive throughs that can be found almost anywhere but there are a few unique ones as well. The Drive Through Pharmacy - get your prescriptions on the go. The Drive Through Bank - and not just the ATM. Speak to a teller through a microphone, make a deposit by putting your money in a plastic tube that will be vacuumed into the bank, it's all possible. It's true what they say, guns are everywhere in Texas. I don't think we've driven a freeway without seeing a giant billboard advertising some sort of gun show. What really baffled us was the first time we entered a restaurant (downtown Fort Worth) to which there was a sign telling patrons that they do not allow guns in their establishment. Seriously. (This is baffling to me as I'm certain if someone saw a lady with a gun in her purse at a restaurant in Canada, the SWAT team would be called in!) It's also the only place I've been where you are bound to see rifle cases circling the luggage claim every time you collect your bags - and I grew up in a fairly popular hunting area. There are restaurants galore in Texas and they are packed every, single night of the week. Don't feel like staying? There's almost always a Take Out counter. With the huge meals and the cheap price tags, it's hard to believe anyone would cook at home. Why build an intersection when you can build an overpass. Freeways are large here and every once in awhile you come to a place where several freeways meet. Instead of people having to exit the freeway in order to join another, tangled masses of cement loop over one another in a complicated mess of overpasses. It's a little intimidating for us 'small-town' folk. This still baffles me and I've even tried it once. Have you been to Texas? What have I missed? Whoa wait... they don't have drive through banks and booze in other states? @Alex - Hahaha. Well I have admittedly only been to a handful of states but I have never heard of a drive through liquor store in all of my travels. We visit the Eskimo Hut in Fort Worth every time just because it seems so crazy to us. Love this post! We have drive through banks and pharmacies in Maryland too but not drive through liquor stores! That would be awesome!! haha ohhh texas. i lived there for a while about 10 years ago and loved every minute of it. its like its own country. my favorite texas quirks happened when driving in west texas. people would wave at me (people on roads were sparse i guess) or the pull over to the shoulder and let people pass thing. it was always fun :) and hearing the word 'fixin' always reminds me of texas! By the way, drive thru pharmacies and banks are everywhere in the US! At least in Texas and the rest of the South, but I'd venture to guess that they are in the North too! I love this! Too funny. What also makes me laugh is that we have drive-throughs for almost everything and ridiculous mazes of overpasses in metro Detroit, too! haha ooooh Texas... I'v actually never been, but Jurgen and I have been dying to take a road trip through the South! Sometimes it seems like it should be a whole other country on it's own! Hi! I stumbled across your blog a couple of weeks ago but I don't think I've ever commented. But the "chicken fried steak" made me laugh! I know what it is but every time I hear it I can't help but think really, they couldn't come up with a better name than that??! And it's so hard explaining it to my British family! HAHA! I love this post. I have lived in Texas for most of my life, so I know all of these things to be true. There was an Eskimo Hut in my college town, and I remember going to class seeing people sipping on a drink in an un-marked styrofoam cup, and I'm thinking, "hmmm...wonder what that is?" haha. Hahahaha, chicken fried steak, what? Texas looks like quite an interesting place to be. I really enjoyed reading your observations! 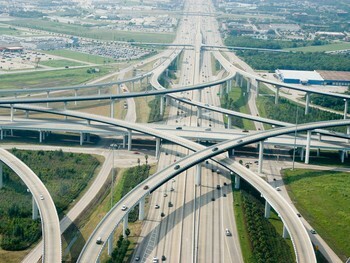 i've never been to texas but holy moly that freeway looks even more intense than in LA! For some reason, we've had chicken fried steak at my old high school in Indiana. There were also drive through liquor stores in IN and OH, but you couldn't get your drinks ready to go, only your typical six packs and bottles of wine. I love finding differences in lifestyles between states, and now between countries since I'm living in Spain! Texas is crazy. Although those highway spiderwebs are all over the us! we have a thing in ski resorts called "the texas tuck". its when people from texas (you can tell because they ski in jeans) tuck and bomb straight down the mountain. I've never been to Texas, but so many people have told me it's like a country all its own! To me, it just sounds like every american stereotype rolled into one...and boy oh boy is that a wonderful thing. THIS! Love this post! Although most of it could apply to my perceptions of Pennsylvania, having moved here from the UK a few months ago. DRIVE THRU EVERYTHING!